Cactuses and succulents are great to work with for many reasons. They are especially easy for the "gardener" who doesn't have a lot of time and knowledge of gardening. They are relatively easy to take care of and since they grow slowly, you don't have to re-pot them frequently, you can leave them unattended for extended lengths of time and don't have to be exact when selecting a location to place them. 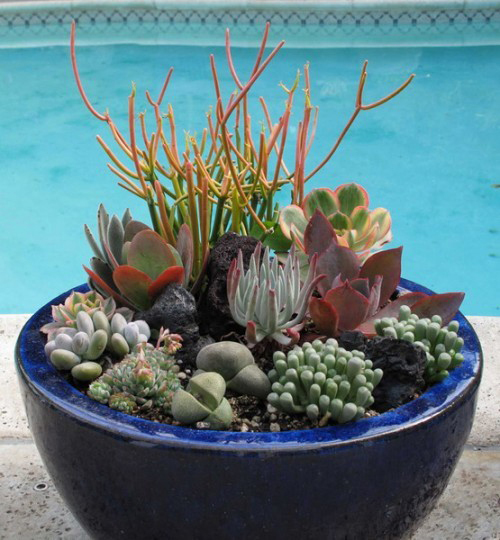 Succulents are plants that store water in their leaves, stems and roots. That is why they look bloated, soft and squishy. They can adapt to the arid desert landscape or the polar opposite - a beach climate. You can find them at mountain cabins and residential front yards. 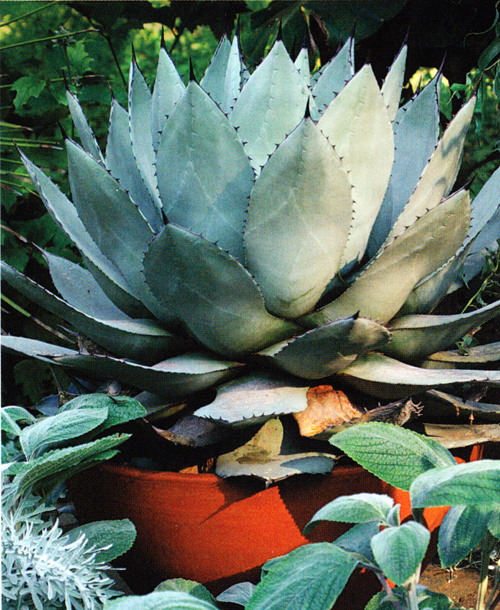 Of course the most recognized succulent is the "hen & chick" and they are adorable to grow. Especially in a Arizona Pottery Chicken pot. Cacti are a type of succulent but unfortunately for small children, pets and some adults, they have sharp spikes. It is best to put them in a location where people are not likely to come in contact with them. They are unusual in shape and size but interesting to look at. Here in Arizona the cacti is sacred. Both types mentioned above really only require some direct sun year round and should be protected come winter time. If you can move them indoors and place them in a sunny window - all the better. If they are to large to move, try placing the large plant on a pot caddy and move it to a sunny patio area when necessary. 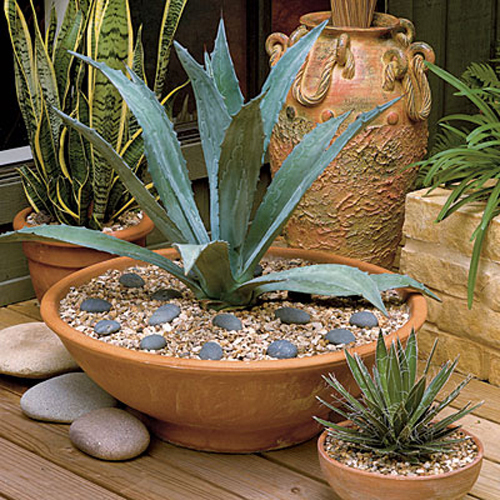 The best types of pots to use are terracotta. Because of the breatheability of clay it really keeps the roots from standing water. A shallow container is also acceptable because the root systems are very shallow. 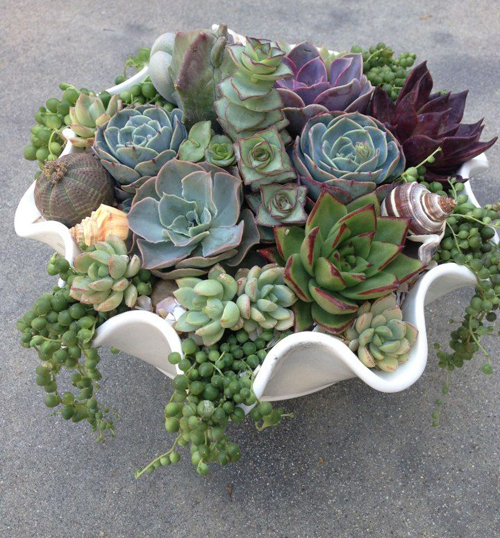 Try selecting a size and style that compliments the succulents. Don't place small cacti in a large container in anticipation of growth. They will look silly and dwarfed. These grow slowly! Don't forget to think out side the box when selecting a container. We love to use pocket pots and place a different type of succulent in each pocket. This look is great! Fertilize once a month, select soil meant for this type of plant material and don't forget to water them. Just because they don't need to be watered every day doesn't mean you can just forget about them.